Walmart was founded in 1962 and is getting wiser to the necessity of creating the future of the store and using AI in all aspects of its business to protect its place as the world’s biggest retailer. Walmart is the biggest American employer and needs to become a Technology company. If it could add more consumer value services it could even join Amazon with a lucrative subscription for extra perks. While Amazon launches more 4-star and AmazonGo stores, Walmart recently announced it will launch an Intelligent Retail Lab inside one of its stores in Levittown, New York. After the announcement that part of Amazon’s HQ2 is going to New York, Alphabet and Walmart appear to be signaling they are also increasing their presence there. One of the reasons for this is of course that many Ivy league graduates end up in NYC at the start of their careers to land the biggest opportunities. A team called Kepler will oversee this. The retailer wants to use AI technology to explore both store associate-facing and customer-facing applications to truly streamline efficiency and customer experiences. Walmart wants its stores to be up to the grade as stores of the future. 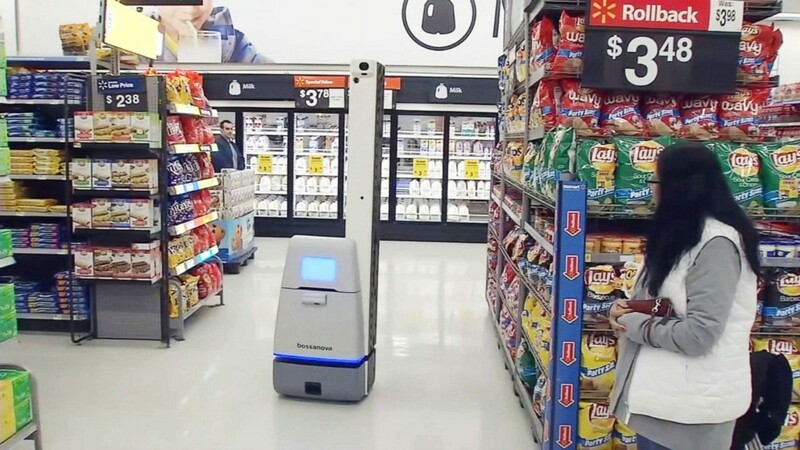 Walmart has been playing the acquisition game and R&D game better in recent years, and even experimenting with shelf scanning and cleaning robots. All to augment better customer experiences. Let’s be honest here though, with Amazon on its heels Walmart has to do this to stay relevant. Walmart’s stores need to be responsive and up to date with AmazonGo and Alibaba’s “New Retail” services and data-harvesting. The AI-race to upend the future store could lead to significant job disruption as automation and algorithms increasingly take on retail. As online retailers move to physical stores, legacy stores like Walmart and even Target need to adapt rapidly adapt or face starting to become less relevant to consumer preferences. In recent times, Walmart has been augmenting its E-commerce experiences and has 11,000 brick-and-mortar stores. Walmart has been busy in R&D and patents in recent years. Its startup incubator Store №8 in California has been working with virtual reality and other technologies, while a new team of Walmart and Microsoft employees has been assembled in Austin to work on cloud technologies. Things are afoot so that retail will become more automated and even more convenient in an era where grocery delivery and VR E-commerce shopping become more mainstream. Walmart was late to E-commerce and is probably a little late to compete with the likes of Amazon and Alibaba in-store. This is troubling since Walmart is essentially a physical retailer in spite of its attempts to prove otherwise. Walmart’s dive into artificial intelligence is however timely. Its Eden project has artificial intelligence technology that inspects fresh food for spoilage, an incredible feat to be sure. Walmart is also offering a kind of mobile checkout now at stores. The new service, called Check Out With Me, and can help speed up checking line traffic jams for holiday shoppers. It’s a far cry from AmazonGo stores, but we’ll take it. Walmart is also looking into ‘scan and go’ type technologies as are a bunch of retailers to at least give the impression they are keeping up with Amazon. Due to the size of Walmart stores though, that Project Kepler would entail cashierless stores is very hard to imagine. Walmart has a new website for the holidays. Having employees with mPOS devices for smoother checkout is at least a start. Some of Walmart’s acquisitions of retail startups have been incredibly smart, though I’m not sure many consumers actually notice. How does Walmart keep up with Alibaba and Amazon, realistically? It’s partnered with Google, Tencent, JD and others but if it cannot keep up, it runs the risk of seeing its empire decline. Whatever happens in retail innovation, the idea is that the consumer always wins. AI is no doubt central to the technology developments Walmart is pursuing but does it have the talent to compete? Walmart’s E-commerce plays have been less than stellar, so it’s difficult to imagine its AI integration is going as fast as its chief competitors.